Hi, very nice website, congrats. Need your advise. I am transiting via HK, never been there. I am travelling with my 1,5 yo son, who will be in the pram. Could you recommend some hostel where we can spend one night. It has to be very close to airport bus stop, so we can walk, and preferably easy to get it and out with the pram, and also somewhere near the mall - where we can eat and walk a bit and stretch before our next 10 hours flight. Also, how much is the bus fare, and is there anything I have to know about them? and also do I have to book the room in the hostel in advance and how can I do it? Thank you very much. I'm going to HK next month with my friends. We want to go to the following places. What is the best itenerary? Hi wanna ask the transportation from the airport going to Mirador Mansion. We'll be travelling in a group of 4 adults from Macau to HK by ferry on 4th March 2012. we'll arrive in HK at around 10am. We plan on staying in HK for 2 nights, leaving to Macau on the 6th March (planning to take the 8am ferry ride to Macau). I'd like to have your suggestions on what we can do for 2 days in HK. FYI: We are planning to stay in Golden Crown or Royal Pacific on Canton rd in TST for 2 days (havent decided yet). We plan to visit these places of interest in HK: Ngong Ping including the village, The Peak, Madame Tussauds, Avenue of Stars, Symphony of Light, Ladies Market and Temple Market. It's rather ambitious i know..to plan on visiting these many places of interest (and many more if time permits-trying my luck here..). That's why we need your suggestions on how we can arrange our itinerary in HK. Your suggestions would be greattttttly appreciated. I am at the airport now and is travelling to Hongkong in an hour. I am staying at The Bauhinia Hotel Tsim Sha Tsui. I am leaving on Thursday night. I want to cover the Avenue of the stars area, Hongkong Disneyland, The Peak, ocean park, ngong ping village for the winter wonderland, ladies market and the big buddha. what will be the best itinerary i can follow? with directions please. i hope you can help me with this tight request. Its my 1st time to HK. i will be travelling to hongkong on the 24th of this month. Could somebody help me get to Disneyland and from Disneyland to Ocean Peak. We'll be staying at Venetian Hostel in Tsim Sha Tsui. and also how can we travel from hongkong to macau and macau to hongkong? thanks. hoping to here from you. Me and im husband is planning to stop over in hongkong for 4days and 3 nights we arrive at Nov6 1220H noon and will depart Nov9 1640H. Below shows our planned itinerary. Please advice if our plan is attainable, and if you have any more better suggestions. Kindly provide us with the most effecient itinerary on our second day while in macau, got no idea, and lastly what documents are needed in going there? and the best currency to use there. 1. Arrival HKIA @ 13:30 PM. Need to get to Holiday Inn at TST. How do i get there ? 3. day trip to Ocean park. How do i get there and back to hotel ? 4. day trip to Disney. How do i get there and back to hotel ? 5. checkout and proceed to macau. i am thinking taking ferry from TST to macau. suggestions pl? 6. macau ferry term to venetian. How do i get there ? 7. lastly from macau ferry to HKIA. is this ok? hoping to learn more from your posts soon. I find your site very very helpful. However, I'm still a little overwhelmed with all the exits. I'd like to ask which is the nearest exit from Tsim Sha Tsui station to Chungking Mansions. Yes, you're right. I've checked the 5-star hotel prices around Kowloon area and generally, they're about HK$500 per night per person higher compared to Regal Airport Hotel. Plus, as you said that you can get a significant discount at Regal Airport Hotel then it may be good for you to stay there specially you're in a group of 5 persons, so that's a lot of savings. You can get to the city with in 24 minutes @ HK$100 (HK$180 - round trip ticket) by Airport Express or by taking a taxi (can accommodate 5 persons) straight to Kowloon area particularly in Mong Kok for street market shopping with in 40 minutes @ HK$250. I have another inquiry. If we are arriving HKG around 6pm, are we still able to go to the night market. Your suggestion is "it's better to stay in Tsim Sha Tsui area but the think the hotels are much expensive compared to Regal Airport Hotel. Airline employees get a decent discount and I don't know if you can suggest hotels which offer the same benefit for airline employees. I wonder if I can save money if we stay in Tsim Sha Tsui area. Another thing the hotels don't have toll free number. Anyway, I hope I can get feedback from you. I suggest you stay in Tsim Sha Tsui area for the tourist attractions are located nearby and very accessible. Here are some recommended budget hotels (scroll down to the bottom of the page). Getting to Tsim Sha Tsui from HK Airport. I find this website very helpful to non frequent traveller to HKG. I would like to ask what is your recommendation, where we can save money the most to check in the airport hotel (airline employees get decent discount but worried about the transp. fee because we are a party of 5) or find hotels within Tsim Sha Tsui area but I noticed that transp. fare going back to the hotel is quite a lot expensive. What can you recommend? Another thing, I find the hotels within Tsim Sha Tsui area so expensive, since we are a party of 5 they always recommend 2 rooms. You may do so by taking the Airport Express trains that runs every 10 minutes from 05:54 to 00:48 daily from Airport to/from City. Journeys between the Airport and downtown Hong Kong take approximately 24 minutes at HK$100 single journey. The night market closes at around 23:00-00:00. Some of the stalls closes earlier and some later but you may still get to the next street for some more shopping. Getting Harilela Mansion from HK Airport (post dated June 17, 2011). Getting to NP360 from Tsim Sha Tsui (post dated June 17, 2011) for travel instruction to major attractions. My wife and I will be going to Hong Kong with our 3 kids and my father n mother in law. I'd like to know how best to get to Harilela Mansion. Also we'll be spending the last night at Disneyland. Getting to Tsim Sha Tsui from the airport. Getting to the Ladies' Night Market from TST: Get to the nearest TST MTR station, take the Tsuen Wan Line trains going to Tsuen Wan and get off at Mong Kok station (7 minutes @ HK$4.6) then take Exit E2. 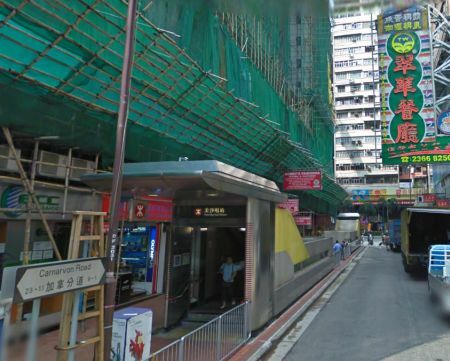 Walk 4 minutes to the market at Tung Choi st.
Getting to Macau from TST (post dated march 15, 2011). Getting to Ocean Park from TST (post dated november 2, 2010). Getting to the Peak, Star Ferry and Avenue of Stars, read this travel route. Getting to Ngong Ping (post dated november 2, 2010). Getting to Disneyland from Ngong Ping (post dated january 10, 2011). You need a visa to get to Shenzhen. Follow link below thsi page for our recommended HK Hotels. We are a 1st timer going to Hong Kong and Macau, We are from Phils., our flight this coming March 06, 2012 arrive in HK @ 2110hrs. We are planning to stay in a hostel in TST area. Please help complete my itinerary. P.M - Macau (Sands Casino, Fisherman’s Wharf , Ruin’s of St. Paul, the old City Wall, Na Cha Temple,A-ma Temple, Venetian. *Back @Hostel in Tsim Sha Tsui. Kindly suggest hostel or hotel that not much expensive that near @ the airport. Here is my suggested itineray. BP International Hotel is a 4-star hotel located at the heart of TST at 8 Austin Road, Kowloon, Hong Kong. About 5 minutes walk to the Austin MTR station Exit F and 6 minutes to the Jordan MTR station Exit C2. Getting to BP International Hotel from HKIA. Day1: HK Airport --> Hotel --> The Peak --> Avenue of Stars --> Symphony of Lights at 8pm. good day we are going to Hong Kong on Feb 4 to 7, 2012. we'll be arriving at 2pm. can you please help me get directions from airport to BP International Hotel at austin rd. With me is my wife and 5 year old son. and can you recommend where to go on our day 1 after checking in. day 2 we'll be going to disneyland. By Taxi: You can take a taxi to your hotel (HK$259.5 @ 41 minutes). By Bus: Go to the Airport Ground Transportation Centre and take the Citybus N21 and get off at the last bus stop (36th stop)(HK$23). I will heading up to Hongkong next month Feb 2012. and I will stay at Intercontinental Hong Kong (18 Salisbury Rd, East Tsim sha Tsui) Could you please show me which is the better way from Hong Kong Airport to East Tsim sha Tsui?Thank you! Here's to read more information about China Visa. And for China Visa general inquiries. Jan 15: Ocean Park--> Victoria Peak--> Avenue of Stars--> Symphony of Lights at 8pm, read this travel route details for "getting there" instructions. Read this topic for discussion about ow to get to Disneyland. Here's a travel instruction on how to get to the HK Museums. may you please help me for my itinerary we are 3 adults and a 2 year old boy. we'll be arriving at HK jan 15 morning and leave by Thursday jan 19.
we will be station at golden crown court in TST and wanted to visit disneyland for a whole day, macau, windows of the world in shenzhen and tour around hong kong including the wax museum all in a budget. pls. help us. thank you. I think your initial planned itinerary is quite tight but yes it is very doable. Here's my suggestion. Day 1: HK airport (7:40am), breakfast in there ==> take a taxi straight to Disneyland around 20 mins drive @ HK$120 ==> The Peak ==> Ladies' Market, getting there instruction here Disneyland to the Peak then street markets. Day 2: Macau --> Shenzhen and visit Window of the World --> back to TST, Hong Kong. Also, please refer to this page for the above travel route instruction (scroll down to the post dated "Oct 24, 2011" on that page). Re: Help! I'm so gonna be lost! Upon arrival at HKIA, you can by-pass Hong Kong and go straight to Macau by ferry, follow link for detailed instruction. From Macau to Citadines Ashley in TST. Please write down any follow up question on that thread. Have a great stay in Macau and HK! good day! I'm Lucky from Philippines. i am seeking for a help how to arrange my itinerary in 2 days vacation. (November 26-28) i want to spend and maximize my 2 days in HK, Macau and Shenzhen China. would it be possible to visit these 3 countries for 2 days? I'll be arriving 7:40am at HKIA. i want to spend my first day in HK. i want to go to disneyland, the peak, avenue of stars and do some shopping at night market. I'll be staying at tsim sha tsui. my second day will be in Macau and Shenzhen. i will just stay for a maximum of 3 hours in Macau then i will proceed to Shenzhen to visit the windows of the world. i will only stay for a maximum of 3 hours in Shenzhen. have to return at tsim sha tsui in the same day. the next day I'll be leaving HK at 4:00am. hope you can help me to arrange my itinerary in the most possible and convenient way. thank you so much in advance and God bless! Help! I'm so gonna be lost! Also, which is the best route to Ocean Park from Citadines Ashley? By MTR? Getting from TST Star Ferry Pier to Central Pier then to the The Peak: Get into the Ferry Pier at Tsim Sha Tsui (TST) along TST promenade and take the Star Ferry to Central Pier (9 minutes @ HK$2.5) --> walk to the nearby Central Pier Bus Terminus --> take bus 15C (open-top) that will bring you to the Peak Tram Lower Terminal (10 minutes @ HK$4.2) --> take the Peak Tram up to Victoria Peak (HK$40 round trip ticket). Getting from the Peak to HK Disneyland: Take the Peak Tram back to the Lower terminal --> take a taxi to Hong Kong MTR station (8 minutes @ HK$25) --> get into the subway station and take the Tung Chung Line to Sunny Bay station --> interchange to the Disneyland Resort Line train that will bring you straight to HK Disneyland (29 minutes @ HK$21.7). Getting from HK Disneyland to Street Markets - Temple Street Night Market: Get back into the Disneyland Resort MTR station and take the train to Sunny Bay station --> interchange trains to the Tung Chung Line and get off at Lai King station --> interchange trains to the Tsuen Wan Line and get off at Jordan station (38 minutes $ HK$17) and then take Exit A --> walk 5 minutes and follow directional signs to the market. Hope this helps! Gud Luck and have a safe HK trip! Here's the most efficient getting there instruction to your tailored HK itinerary. Getting to NP 360 from airport: HK airport --> taxi to Ngong Ping 360 Cable Car Terminal at Tung Chung (10 minutes @ HK$45), you have an option to leave your luggage at Citygate Outlets --> take the cable car to Ngong Ping (25 minutes @ HK$115 round trip ticket) --> explore Ngong Ping and the rest of Lantau Island tourist attractions. Getting to Ocean Park from Ngong Ping: Take the cable car back to Tung Chung --> you may opt to do shopping at HK Shopping - Citygate Outlets before getting into the Tung Chung MTR train station --> take the Tung Chung Line train all the way to Hong Kong station --> walk to the adjacent Central station --> take the Island Line train to Admiralty station (38 minutes @ HK$18.8) and take Exit B --> take bus CTB 629 to Ocean Park entrance (25 minutes @ HK$10.6). Getting to Symphony of Lights from Ocean Park: Take the bus 629 back to Admiralty MTR station --> take the Tsuen Wan Line train to Tsim Sha Tsui station (5 minutes @ HK$8.1) and take Exit F --> 5 minutes walk to the TST promenade where you can visit the Avenue of Stars and watch the nightly show "A Symphony of Lights" that starts at 8:00pm. Getting to Ladies' Market from Symphony of Lights: Get back into the Tsim Sha Tsui MTR station --> take the Tsuen Wan Line train to Mong Kok station (7 minutes @ HK$4.6) and take Exit E2 --> walk 4 minutes to the market at Tung Choi st.
We will be leaving (4) by Aug 26 and return by Aug 29 dawn. If you're looking for a place to stay at TST, the Mirador Mansion is a building being comprised with lot of Guest House or Hostel. Upon your arrival at the entrance in the ground floor, right upon exit at MTR station, anytime you'll expect a two or three persons that will approach you to bargain their hotel rooms. So there's really nothing to worry about as you can quickly and easily get one whenever you like. I found the instructions to Mirador Mansions very helpful. I plan to find a place in Mirador Mansions on Wednesday morning (Aug 10 around 12am-1am) after the concert of the Red Hot Chili Peppers. Is it still possible to find a place there at that time? Or would there be someone by the MTR exit who can help me find a room at that time? I assume that you're referring to bus that comes from HK Airport (Ground Transportation Centre). The CTB A21 as mentioned above will take a round Tsim Sha Tsui area but the last stop is located at Hung Hom. Actually at Cheong Wan Road outside Hung Hom Station Concourse. The fare is HK$33. Other bus, N21 that has an overnight schedule with a route from HK Airport (Ground Transportation Centre) to Tsim Sha Tsui area and the last stop is located at Salisbury Road outside Tsim Sha Tsui Star Ferry Pier. It has a total of 37 stops. The fare is HK$23. I plan to stay in Tsim Sha Tsui. Where is the last stop of bus near / around Tsim Sha Tsui area ? Because if I want get back to my stay, & maybe I'm in the place that unreachable by MTR. I also feel loss if I take the bus and alight in the place that far from last stop of the bus. In Hong Kong, here's what to do when taking a public bus and paying bus fare with cash or without using an octopus card. Upon getting into the bus (front side), you'll see a metal fare box located next to the bus driver. Put the exact amount of money thru the slot on top of the fare box whether it's a notes or coins or the combination of both. After doing so, just proceed to the bus seats. Anyway, the driver knows how much money you put in and call your attention only if it is not enough. You'll not be issued with ticket or any form of receipt. If I pay without octopus, of course I will need pay with exact cash. I want to ask, after I pay the fare, is there anything to do or no? for example like take the ticket. Because in Singapore we need to take the ticket if paying without card. Re: 1 night Hong Kong stop over (cont.). Here's the Citybus no. A21 bus stops location map to & from HK airport at Tsim Sha Tsui and some area of interest. The hostel charge per night is ranging from HK$150 to HK$300. One regular meal at fast food restaurants like KFC or McDonald has an average of about HK$30. Hope this help and good luck on your stay in Hong Kong! Re: 1 night Hong Kong stop over. I would like to re-phrase to what I've said re bus in HK. What I mean actually is that the MTR trains should be more comfortable than a bus but of course taking a bus with your 1.5 yo son is not a problem. The octopus card has a great advantage when touring around Hong Kong. Not only that it will save you lot of time when you take the MTR trains, bus or pay some stores but also, it will give you some discount on fares. There's NO expiration date for the card but you need to pay a handling fee of HK$7 if returned with in 3 months. Example if don't have an octopus card, the bus fare is HK$24.5 so you need to prepare for the exact amount (so imagine if you don't have an HK$0.5 in your pocket) to avoid a delay in the line and remember that most people in HK are always in hurry. Also if you give more than the required amount you'll NOT be given any change. But in your case, as long as you can secure the exact amount needed before you take the bus then everything should be fine. Here's how to get from HK airport to Mirador Mansion in TST by bus. When you get into the arrival hall at HKIA, follow the directional signs that will guide you to the Airport GTC (Ground Transportation Centre) or airport bus terminus and it is to your right (left side for taxi) and about 3 minutes walk upon exit from the arrival hall. Take the bus no. A21 (Citybus) at Airport GTC (bus stop no.1) to bus stop no.13 at 82- 84 Nathan Road near Tsim Sha Tsui Station (Exit B1) then take about 3 minutes walk to the Mirador Mansion (please see map below). Bus travel time is approximately 62 minutes @ HK$33. Take the same bus, CTB no. A21 from the bus station located almost opposite to the Mirador Mansion, at 83 Nathan Road before Haiphong Road, opposite Carnarvon Road and the Tsim Sha Tsui Station Exit D1. You need to cross to the opposite side of Nathan Road from Mirador. Bus travel time is approximately 64 minutes @ HK$33. Is there such bus? And do I have to buy Octopus card for it as well? If I buy it, can I keep it till I am in HK next time (in 2 months)? If you're looking for a hostel for a night stay in HK it should be somewhere in Kowloon area as we can hardly find it elsewhere. I would suggest Mirador Mansion in Tsim Sha Tsui. It is a building that comprises a number of hostels and also, malls, signature shops, restaurants, fast food restaurants like KFC or McDonald, and transportation specially MTR trains is a proximity. Taking a bus with a child in a pram is quite uncomfortable, so I would suggest that you take the trains instead. Buy an octopus card from the Airport Express counter upon exit from HK immigration at the arrival hall in HKIA and surrender it to the same counter before departure to get your HK$50 deposit refund plus the remaining balance on the card. Take the Airport Express from airport station to Tsing Yi station. Interchange to the Tung Chung Line MTR trains going to Hong Kong station but you need to get off at Lai King station. 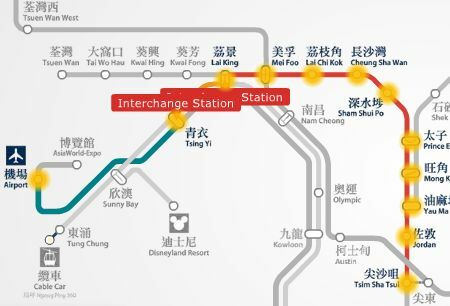 Interchange trains to the Tsuen Wan Line going to Central station and get off at Tsim Sha Tsui station then take Exit D1 or D2 (42 minutes @ HK$60 fare for Airport Express and MTR trains are FREE using octopus card). So actually, you'll only use your octopus card when you get into the Airport Express train and then upon exit at Tsim Sha Tsui MTR station. It is not needed on the interchange stations. Here's the Airport Express plus MTR trains route map between airport and Tsim Sha Tsui station. The Mirador Mansion building is just right there upon exit of the MTR station. There is NO need for you to book in advance as you can easily get one and there are always people waiting at the ground floor that will guide you to the guest house. Here's what you see upon exit at Tsim Sha Tsui MTR station Exit D2. Right side is the Mirador Mansion and the street crossing ahead is the Nathan Road where you can easily find restaurants and malls.